We took this guided tour with a wonderful guide Farit. He was informative and funny. 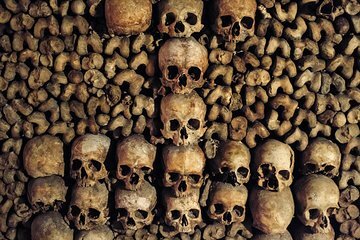 We weren’t sure what to expect or did not know the history of the Paris Catacombs. After this tour, we had an appreciation of this underground graveyard. Would not recommend this tour if you are claustrophobic or seeing bones make you squeamish. 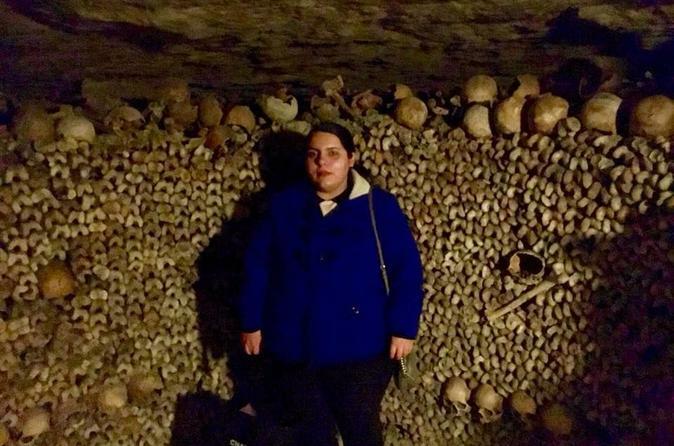 My daughter wanted to visit the catacombs of Paris so I booked this tour in order to skip the line. We both loved it! We learned a lot of Paris history as well as the catacombs. Our tour guide was funny, informative, and very personable. Awesome tour, guide really brought the history and stories to life. Get the kids engaged throughout. Our guide, John, is exceptionally knowledgable about the layout, history and contents of the catacombs and his narration was well informed, interesting and entertaining. Beware, he knows where the local pet shop with cute puppies is and will gladly inform your teenager of the same. It was Hugo and he was funny, had some great insights into the stories of the catacombs. The place was amazing! This tour is a must if you are considering the Catacombs. Our Guide Katlin was fantastic, very knowledgeable, great fun with excellent stories. The line was considerable when we arrived at the Catacombs area and we were a bit apprehensive about the likelihood of skipping much of it. Anyway we meet with Katlin on time at the easy to find place and pretty much walked straight in and started the tour - brilliant. DO IT DO IT you will not be disappointed. Hugo our guide was fabulous! He was enthusiastic, funny and very knowledgable. He truly wanted you to learn something about Paris history not just to see the site. Stairs are not for the faint of heart! Fastest 2 hours I’ve spent! Loved it! Excellent tour. Our guide Kaityln was super informative and made it fun with her humor and witty stories. Loved the special access sites. Would recommend this to anybody! The history behind the catacombs was very intriguing. Our tour guy was very knowledgeable and personable. Without him I don’t think I would have appreciated the tour as much. I highly recommend this attraction with a guided tour and hopefully you get James!!! We had Tara as our tour guide and John as our driver. Both were wonderful. John did a great job driving and changing the music. Tara kept things interesting and fun. She always had a smile on her face and you could tell that she enjoyed her job. During the rope bridge we had a slight issue and we were late on the bus. She was super understanding and sweet. We went on the rope bridge. There is a line to initally cross, and then another line to cross back. We were able to cross quite quickly, but we were not able to cross back for about 30 minutes. We had to run to make it back to the bus on time. We got about 1.5 hrs in belfast because we were ahead of schedule. The rest stop had a Gregs and a Subway. They also had candy and other quick bites. You do not need a passport if you are from the U.S. Remember you need to pay by credit card or POUNDS in Northern Ireland. It rained for us so bring panchos! Be careful on Giants Causeway some of the rocks slide and you could fall. Don't take any risks just to get that perfect picture. We had lots of fun and it was a great tour overall.